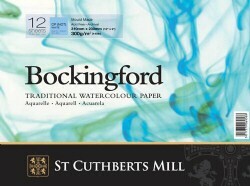 Bockingford is a traditional English watercolour paper made on a cylinder mould machine. It is a high quality, archival standard paper made from 100% alpha cellulose. Its attractive surface is created using natural woollen felts that give it a distinctive random texture. Appreciated for its excellent colour lifting abilities. This is an extremely forgiving watercolour paper valued by artists around the world. - Half Sheets and Full Sheets. The pads contain 12 sheets. Half sheets are 56x38 whilst full sheets are 56x76cm. Measurements may vary slightly due to the deckled edges of the paper. Full sheets are 56x76cm. Half sheets are 53x38cm. Measurements may vary slightly due to the deckled edges of the paper. Large sheets are denoted with an L. There is a 5 sheet minimum for the large sheets. You can mix any brands and types of paper to reach the five sheet minimum.